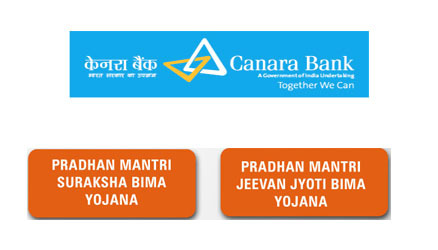 Canara Bank Accounts holders can register for PMSBY and PMJJBY Pradhan Mantri Social Security Insurance Schemes through SMS, so how to get registered for Pradhan Mantri Social Security Schemes like Pradhan Mantri Suraksha Bima Yojana (PMSBY) and Pradhan Mantri Jeevan Jyoti Bima Yojana (PMJJBY) you will be knowing by following below guide. To Register for Pradhan Mantri Suraksha Bima Yojana (PMSBY) and Pradhan Mantri Jeevan Jyoti Bima Yojana (PMJJBY) in Canara Bank through SMS just compose SMS as mentioned below. To Register for Pradhan Mantri Jeevan Jyoti Bima Yojana (PMJJBY) through SMS type Scheme Name <PMJJBY> <DIGIT OF ACCOUNT NUMBER> <NOMINEE RELATION> and Send it to 9266623333. To Register for Pradhan Mantri Suraksha Bima Yojana (PMSBY) through SMS type Scheme Name <PMSBY> <DIGIT OF ACCOUNT NUMBER> <NOMINEE RELATION> and Send it to 9266623333. That’s it once you get successfully registered for the Pradhan Mantri Suraksha Bima Yojana (PMSBY) and Pradhan Mantri Jeevan Jyoti Bima Yojana (PMJJBY) Schemes in Canara Bank the annual premium amount will get auto-debited from your Savings Bank Account. Alternatively if you have Canara Bank Internet Banking Service enabled than you can even register for Pradhan Mantri Suraksha Bima Yojana (PMSBY) and Pradhan Mantri Jeevan Jyoti Bima Yojana (PMJJBY) through Internet Banking under Investments tab. pmby subscription 18342705150494158 —— ????????? this is sachin, as i Registered for PMSBY and PMJJBY in Canara Bank through SMS, but i still didnt get any confirmation message or mail regarding this. how to get confirm the above scheme are linked with my account. Digit of account number means total number of digits of that account number or have to mention account number fully? This is M.Natrayan , as I Registered for PMSBY in Canara Bank Guziliamparai through Net Banking , but i still didnt get any confirmation message or mail regarding this. how to get confirm the above scheme are linked with my account. Kindly arrange to send Insurance Certificate urgently. Take a home loan in Canara bank and also submit all Pradhan mantra avas yojna document for subsidy . how many time take for subsidy ???? ?